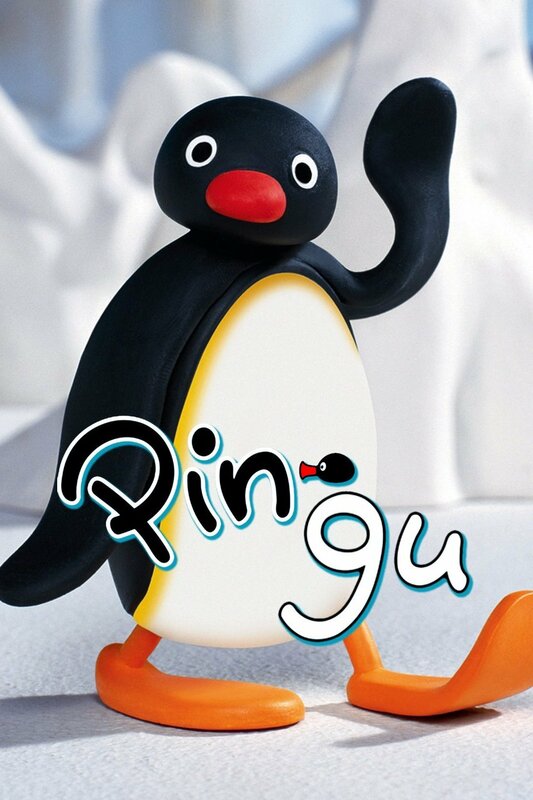 Pingu fue una serie animada de origen suizo escrita por Silvio Mazzola y dirigida y animada por Otmar Gutman. La serie consistía en la vida de una familia de pingüinos que vivían en el Polo Sur, y más concretamente las historias trataban sobre el hijo mayor Pingu, de 8 años, y su amigo Robbie la foca. 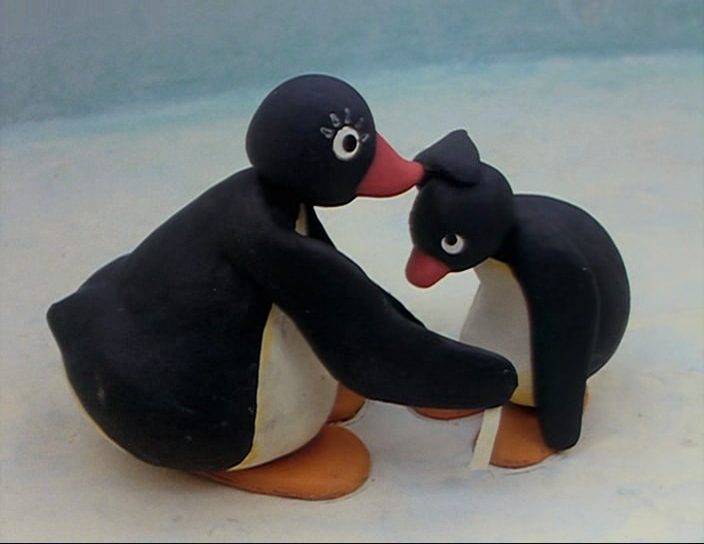 También había muchos capítulos en los que aparecían el padre y la madre de Pingu así como (después que saliera de un huevo) su hermana pequeña Pinga y otros muchos personajes secundarios. Mi segundo aporte a la comunidad. Hello Pingu (May 28, 1986) - Pingu tries to rescue his rubber ball. Pingu Delivers the Mail (June 4, 1986) - Pingu helps his father to deliver the post. Pingu Looks After the Egg (June 11, 1986) - Pingu is egg-sitting while his parents are out. The New Arrival (June 18, 1986) - Pingu's new sister, Pinga, is born. Pingu Goes Fishing (June 25, 1986) - Pingu goes fishing and makes a new friend. Jealousy (September 16, 1988) - Pingu is jealous because his Mother gives Pinga all her attention. Hide and Seek (September 23, 1988) - Pingu and Robby have a snowball fight. Barrel of Fun (September 30, 1988) - Pingu and Robby have fun riding in a broken old barrel. Pingu Plays Fish Tennis (October 7, 1988) - Pingu and Robby play with an enormous fish. Skiing (October 14, 1988) - Pingu has fun with skis, but is he any good at skiing? Sledging (October 21, 1988) - Pingu has difficulty with his sledge but knows how to solve the problem. Lost Baby (October 28, 1988) - While playing with his friend, Pingu's sister Pinga runs away! Ice Hockey (October 29, 1988 - Pingu and his friends play an ice hockey game. Pingu Runs Away (September 24, 1990) - Pingu is punished and decides to run away but ends up getting lost and scared. Building Igloos (October 1, 1990) - Pingu and Pingo decide to build an igloo but cannot agree on where to build it. Pingu and Pinga Stay Up (October 8, 1990) - Pingu and Pinga try to avoid going to bed. Music Lessons (October 15, 1990) - Pingu pulls an accordion out of the toy chest, but the noise is awful when he plays it. Little Accidents (October 22, 1990) - Pingu rushes to the loo because he has drunk too much, but his father is in the bathroom. School Time (October 29, 1990) - Robby goes to school with Pingu. Pingu's Ice Cave (November 5, 1990) - Pingu and his friend get trapped in an ice tunnel. Pingu's Dream (November 12, 1990) - Pingu has nightmare of a huge walrus! Grandpa is Ill (November 19, 1990) - Grandfather is sick, so Pingu and Pinga set off with their mother to look after him. Pingu and Pinga at Home (November 26, 1990) - Pingu and Pinga have a party while their father and mother go to a concert. Noise (Decemebr 3, 1990) - Pingu and his friends are playing ball, but they do not notice how loud they are. Pingu and the Barrel Organ (December 10, 1990) - Pingu goes shopping for poor Mr. Peng-Hoven. Pingu's Circus (December 17, 1990) - Pingu, Pinga and Robby play at putting on a circus. Pingu at the Doctor's (August 20, 1991) - Pingu gets carried away while playing and hurts his beak. Pingu's Admirer (August 27, 1991) - Pingu is irritated to find he has a female admirer. Pingu and the Seagull (January 16, 1992) - Pingu is plagued by a mischievous seagull that becomes a constant irritation. Pingu Goes Ice Surfing (January 23, 1992) - Pingu goes surfing with his mother's freshly-washed bed sheet. Pingu's First Kiss (January 30, 1992) - Pingu and Pingi want to have their first kiss, but everyone keeps interrupting them. Pingu's Curling Game (February 6, 1992) - Pingu is using a hot water bottle as a curling stone, but he is not very good. Pingu the Icicle Musician (February 13, 1992) - Pingu uses icicles to make music. The sound leads his friends to an amazing ice cavern. Pingu the Chef (February 20, 1992) - Pingu and Pinga, at home alone, feel hungry and try to cook pop-corn. Pingu's Family Celebrate Christmas (December 25, 1992) - Pingu and Pinga can scarcely wait for the handing out of presents. Pingu Goes Away (March 2, 1993) - Pingu feels homesick when he visits his aunt in another village. Pingu the Photographer (March 9, 1993) Pingu takes lot's of photographs, but forgets to take the cap off. Pingu's New Kite (March 16, 1993) Pingu and Pinga's kite is stuck on the roof, and they try to get in down. Pingu and the Many Packages (March 23, 1993) Pingu's shopping to find a perfect gift for Grandpa. Pingu the Conjurer's Apprentice (March 30, 1993) Pingu is holding a magic show. Pingu's Birthday (April 6, 1993) - It's Pingu's birthday, and his friends are coming over to celebrate. Pingu the Babysitter (April 20, 1993) - Pingu is left to look after two baby twins. Pingu's Visit to the Hospital (March 15, 1994) - Pingu and his mother visit the hospital to see Pinga and Pingi. Pingu Pretends to be Ill (July 13, 1995) - Pingu pretends to be sick. Pingu and the Message in a Bottle (August 17, 1995) - Pingu finds a message in a bottle, and is curious to find out what the message is. Pingu and the Ghost (August 8, 1996) - Pingu starts getting paranoid about ghosts. Pingu's Discovery (August 22, 1996) - Pingu and Robby found an ancient artifact, so they brought it over to the museum along with Pingu's grandfather. Pingu Refuses To Help (January 6, 1998) - Pingu has a rough day, so he can't help out. Pingu the Archer (January 14, 1998) - Pingu was taught how to use a bow and arrow by his grandfather, but soon started getting a little carried away. Pingu Teases Pinga (January 23, 1999) - Pingu pranks Pinga by placing her stuffed rabbit on their snowman. Pingi's Valentine Card (August 22, 2003) - Pingu receives a Valentine card from his girlfriend Pingi, but is having trouble on how to make one. Pinga's Lost Rabbit (September 12, 2003) - Pinga's stuffed rabbit is missing, so she and Pingu have to look for it. Pinga Sleepwalks (September 26, 2003) - Pinga started sleepwalking in the middle of the night, much to Pingu's horror. Pinga has Hiccups (January 16, 2004) - Pinga gets the hiccups, and Pingu attempts to cure her. Stinky Pingu (January 28, 2004) - Pingu is stinky, and needs to take a bath. que gran aporte, es muy dificil conseguir los capitulos completos.